A trippy head band. Duuuuuude! Data moves only one direction along these strips — they have a definite “in” and “out” end, and the microcontroller must be attached to the “in” end. At the ends of each strip are four solder pads. If you look closely, the two middle pads are labeled either DI and CI or DO and CO. These stand for “data in” and “clock in,” and “data out” and “clock out,” respectively. We want to connect wires to the “in” end, so we’ll use the group of 4 pads labeled GND/DI/CI/+5V. Some strips arrive with plugs pre-wired for testing at the factory, but these might be at either end of the strip and aren’t necessarily useful for connecting to the microcontroller — in most cases you’ll still have to solder your own wires. Check three times to make sure you’re connecting to the INPUT side! Just because your strip includes a plug does not mean it is useful. You might get lucky, but odds are against it. To make the images clearer, we removed the plastic covering for this tutorial. However, you can just cut a little bit away on yours to allow you to access the pads. Once you take off the plastic cover its a bit difficult to get it back on. That's it! Now you're ready to use the strip. You may want to use heatshrink to provide a secure cover for the wires, or stuff hotglue in the end, which will do the same. Connect the Red +5V power wire to your 5V power supply. 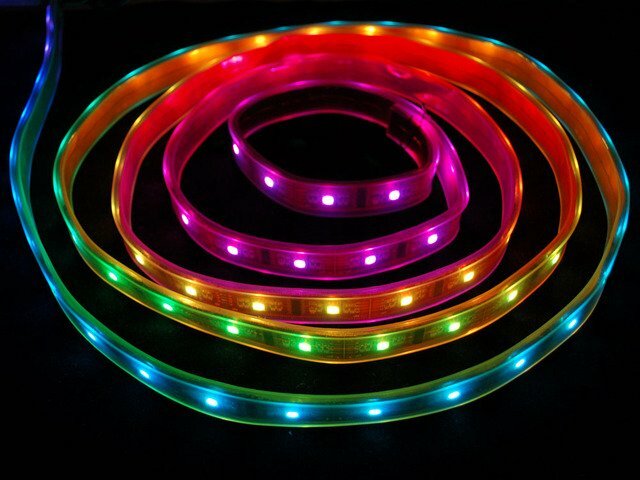 Each single RGB LED can draw up to 60mA from a 5V supply. That means a full meter can use nearly 2 Amps. That’s a peak rate, which assumes that all the LEDs are on at full brightness. If most of the LEDs are kept dim or off (as when animating patterns), the power usage can be 1/3 this or less. As shown in the previous wiring diagram, connect ground to both your power supply and microcontroller. Then connect the 5V line from the power supply to the red wire on the LED strip. Never, NEVER connect more than 5 Volts to the strip! This will permanently damage it! Our 5 Volt, 2 Amp power supply is ideal for a one meter strip. 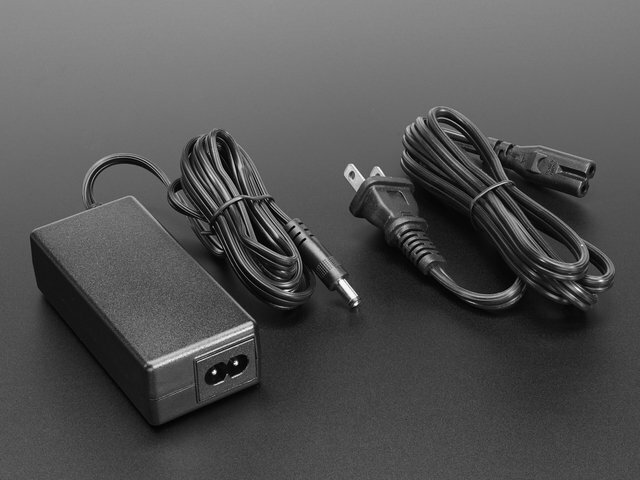 For larger projects, our 5 Volt 10 Amp power supply is good for up to 5 meters (160 pixels total). 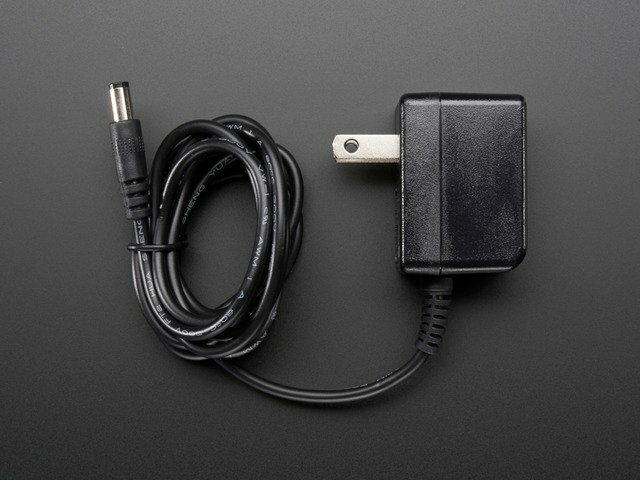 The female DC power adapter mates with either of the above power supplies. 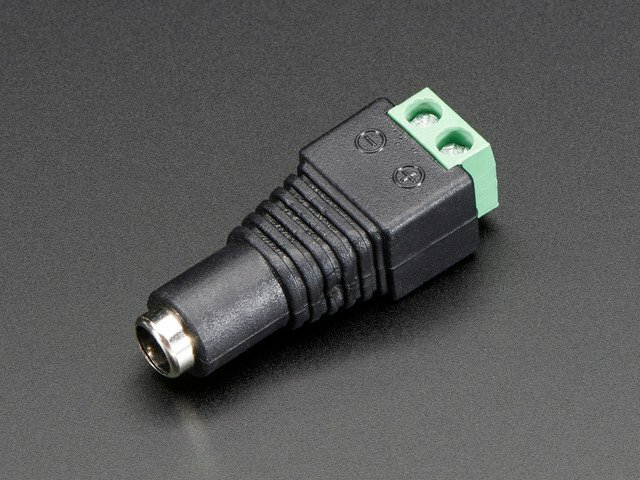 Screw terminals clamp down on power wires at the end of a strip. Note the embossed polarity markings. Connect the red wire to the + terminal and the black wire to the - terminal. When creating longer runs, power should be split and applied every meter. If you try to power too many LEDs from just one end of the strip, they’ll start to “brown out” the further they are from the power supply. Strands can be powered from either end — “input” and “output” doesn’t apply to power, only the data signals from the microcontroller. 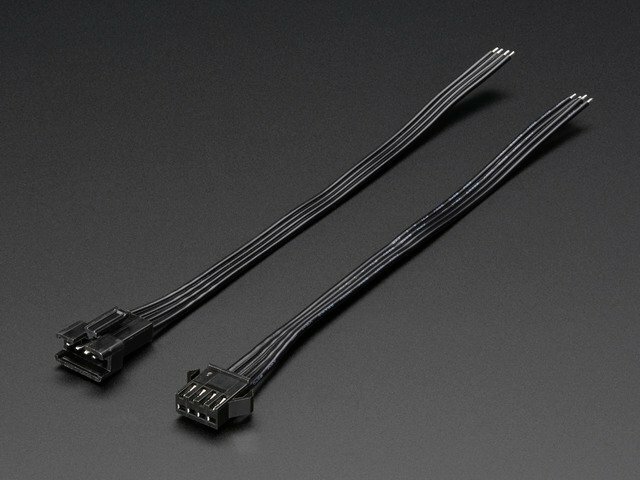 If the 10 Amp power supply isn’t large enough for your project, a slightly modified ATX computer power supply can provide 30 Amps to power upwards of 500 pixels! Generally speaking, you should not try to power an LED strip from the Arduino’s 5V line. This is okay if just a few pixels are lit, but is not adequate for driving a full strand. For a standalone application (not USB connected to a computer), you can power the Arduino from the same regulated 5V supply as the LEDs — connect to the 5V pin on the Arduino, not Vin, and don’t use the DC jack on the Arduino. To download the Arduino library, visit the repository on GitHub . Click the DOWNLOAD ZIP button near the upper left, extract the archive and then rename the uncompressed folder to LPD8806. Confirm that this folder contains the files LPD8806.cpp and LPD8806.h and the examples folder. Place the LPD8806 folder inside your Arduino libraries folder. You may need to create this folder if it does not yet exist. In Windows, this would be (home folder)\My Documents\Arduino\Libraries and for Mac or Linux is (home folder)/Documents/Arduino/Libraries. We also have a tutorial on library installation. The other two example sketches — LEDbeltKit and advancedLEDbeltKit — are part of a kit based on a different controller board, and won’t work on a standard Arduino without modification. This is just a matter of pin assignments…if you’re crafty you should be able to figure it out. Confirm the Arduino is connected to the INPUT end of the strip. If your strip came with a plug pre-soldered, there is only a 50/50 chance this is the correct end. Examine the strip closely, and solder wires to the INPUT end if needed. Check power supply polarity and voltage. Are + and - swapped? If you have a multimeter, confirm 5V DC output (±10%) from the power supply. Confirm that the number of LEDs in the LPD8806() constructor match the number of LEDs in the strip (both will be 32 if using the strandtest example and a single meter of LEDs). Check for conductive detritus that may have gotten into the strip: solder balls, frayed bits of wire, etc. Between each pair of LEDs there’s a small chip. Find the chip corresponding to the first bad LED, and give the strip a firm squeeze here — it may simply be a dodgy connection. Try this with the prior chip as well. If that works, you can either touch up the connections with a soldering iron, cut out the offending section of strip and join the two sub-strips, or arrange for a replacement strip if it’s new. This can happen when trying to power too long of a strip from one end. Voltage will drop along the length of the strip and the furthest pixels will “brown out.” Connect power every meter. Confirm the library is properly named and located. The folder should be called LPD8806, and placed inside your personal Documents/Arduino/Libraries folder — not inside the Arduino application folder! All our LED strips are manufactured in 1/2 meter long sections, and these sections are then joined to produce strips up to 5 meters long. For other lengths, you can normally cut the flex strip between each pair of LEDs…but if this coincides with one of those 1/2 meter joins, you must instead pull apart the soldered sections. It’s not terribly hard, but worth documenting! For this, we use the wide flat tip on our METCAL iron. A wide tip isn’t required but it sure is handy! How many pixels can I control at once? The theoretical limit for pixels - assuming you can power them all - is infinite! In reality, there's a limit because the controller chip must store the entire LED strip pixel data in memory. Each pixel takes up 3 bytes. For an Arduino Uno (or other '328 based 'duino), the processor has very limited memory, that means that you can't really run more than 250 or so pixels. That number is a little dependant on what else the Arduino is storing - for example the SD library takes up a massive amount of RAM memory. In our experience, most people have issues with over 150 pixels. There is no easy way to check runtime RAM usage (unlike the FLASH storage which is printed out on compilation) so if you're having issues with longer strips, shorten the strip or update to a Mega which has tons more RAM. Long strips of pixels start failing! See above, you are likely running out of RAM storage.